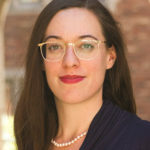 Hannah Bloch-Wehba was an IILJ Scholar from 2010-2013. She received her J.D. from NYU Law in 2013 and went on to become an Associate Research Scholar in Law, Clinical Lecturer in Law, and a Stanton First Amendment Fellow, Information Society Project at Yale Law School. Most recently, she was the Stanton National Security Fellow at the Reporters Committee for Freedom of the Press. She previously worked as a litigation associate at Baker Botts LLP.